28-Abr-2012 -- Após conquistar a confluência 10S 39W neste mesmo dia, voltamos em direção à cidade de Canudos, onde paramos num posto para abastecer as motos e almoçar. As 2:00 p.m. a temperatura estava tão elevada (40ºC) que faltou ânimo para sair da sombra, montar nas motos e enfrentar o asfalto quente. Mas ainda faltava conquistar a confluência 9S 39W e não podiamos desistir. Foi então que levantamos das cadeiras do restaurante, subimos nas motos e seguimos sobre o asfalto escaldante da rodovia BR116 até a cidade de Chorrochó. Chegando a entrada da cidade de Chorrochó resolvemos abastecer novamente as motos pois não sabíamos o que iriamos enfrentar. Seguindo o GPS cruzamos o centro da cidade e fomos até a praça principal onde perguntamos aos moradores locais sobre o acesso a estrada BA311. Para nossa surpresa a estrada BA311 não possui pavimentação e tem muitos buracos e atoleiros. O local é um verdadeiro labirinto onde trafegam poucos carros. Sem o GPS seria muito difícil conseguir sair daquele lugar. Pilotamos nossas motos por quase um hora, entrando em fazendas, pedindo informação até que conseguimos chegar em um açude vazio em função da seca que assolava a região. Desse açude, resolvemos cruzar a caatinga pilotando as motos entre arbustos e espinhos, pois o anoitecer já estava próximo e não seria seguro estar alí após o pôr do sol. Em busca da confluência, passamos pelo leito seco de vários córregos até chegar a confluência 9S 39W. O acesso a esta confluência é difícil e é necessário roupas apropriadas para caminhar na caatinga, assim como facão para abrir caminho na vegetação. 28-Apr-2012 -- After conquering the confluence 10S 39W on this same day, we headed back toward the town of Canudos, where we stopped on a tour desk to supply the bikes and have lunch. The 02:00 pm the temperature was so high (40° C) that lacked courage to get out of the shadow, mount on the bikes and face the hot asphalt. We still have to conquer the confluence 9S 39W, so we could not give up. We get up of restaurant’s chairs, jump on motorcycles and continue on the hot asphalt of the road BR116 until the city of Chorrochó. Arriving at the entrance of the city of Chorrochó decided to supply the bikes again because we didn't know what we would face. Following the GPS crossed the Centre of the city and headed up the main square where we asked the locals about the access to the road BA311. To our surprise the road paving and BA311 has not many holes or bad spots. The site is a true labyrinth where it travels a few cars. Without the GPS would be very difficult to get out of that place. We ride our bikes for almost an hour, going into farms, asking for information until we arrive at a empty dam due to a heavy drought that ravaged the region. At the dam, we decided to cross the thorny scrub riding the bikes between it, as dusk was next and it would not be safe to be there after sunset. In search of the confluence, pass by the dry bed of several streams until you reach the confluence 9S 39W. 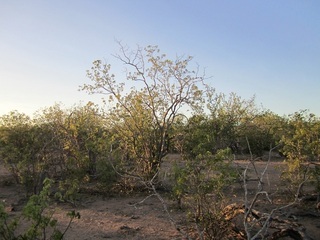 The access to this confluence is difficult and you need appropriate clothing for walking in the thorny scrub, as well as the machete to make way in the vegetation.